My valentines proposal. Will add pictures later. This was in our local paper!! Published: Monday, February 17, 2014 at 14:56 PM. OKALOOSA ISLAND — Many men can be spotted in the store come Valentine’s Day trying to decide which of the few bouquets of flowers left should be purchased for their sweetheart. Daniel Tyson spent about six months planning for Feb. 14. 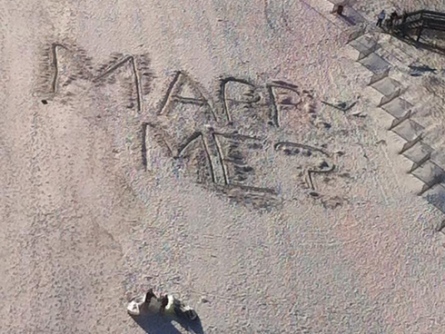 On Friday, Tyson executed what many of his friends are calling the proposal to end all proposals with a week-long Valentine’s celebration and a marriage proposal written in the sand. “She had told me if I wanted to marry her I had to ask her and put a ring on her finger,” Tyson said of his now-fiancée Jennifer Emery. “I worked on the plan over the course of the fall. We’d never done anything special on Valentine’s Day so I knew that would be the perfect day. Tyson spent the week “building the tension” by taking Emery, his girlfriend of two years, to dinner and a movie, buying her fancy chocolate and sending her two dozen white roses – a gift every day until Valentine’s Day when he convinced her to take a helicopter ride with him over Okaloosa Island. Tyson had the ring ready to go as soon as Emery turned her head. Inside the helicopter the two got engaged while outside two of Jennifer’s sons, her grandson and several of the couple’s co-workers from Destin West and Jackson Hewitt watched from the beach.